Bitcoin Cash (BCH) is a “fork” of Bitcoin (BTC), essentially a carbon copy of the existing currency with distinctive structural changes — in Bitcoin Cash’s case, an increase in the amount of data allowed in each “block” of recorded transactions. Bitcoin has seen many forks through its eight years, but BCH took the novel step of duplicating every user’s existing balance — if you owned 3.3 Bitcoin at the time of the fork, you owned 3.3 Bitcoin and 3.3 units of Bitcoin Cash after. Some high-profile early Bitcoin advocates have switched allegiance to BCH, notably Roger Ver, the owner of Bitcoin.com, and Jihan Wu, the co-founder of Bitmain, which manufactures a large share of the devices used in Bitcoin/Litecoin/Dash/Bitcoin Cash mining. Why Do BTC & BCH Hate Each Other? Right now, sending Bitcoin is very slow and expensive because people are performing transactions much faster than the network can confirm them. BCH fans say that their coin can handle Bitcoin’s transaction volume without high fees or long wait times because of the larger size of blocks in its blockchain. Bitcoin Cash advocates say that their coin is closer to the “original vision” of Satoshi Nakamoto, Bitcoin’s pseudonymous creator, of peer-to-peer digital cash that can be used for everyday commerce like buying a cup of coffee. Critics believe that BCH is trying to capitalize on confusion, receiving money intended for Bitcoin; for instance, the official Bitcoin.com mobile app creates a Bitcoin Cash wallet instead of a BTC one by default. A recent, unverified anecdote from a Bitcoin fan claims that he witnessed someone lose money trying to buy Bitcoin at an ATM, not realizing that the wallet he created with Ver’s app could not receive it. Coinbase is one of the biggest companies for people in the English-speaking world to convert their fiat currency into digital currency. Most “cryptocurrency” exchanges do not allow users to convert U.S. dollars, thanks to strict regulatory requirements, but Coinbase and its real-time trading platform GDAX have made the process simple enough for many users who are not technologically savvy. Until Tuesday, Coinbase only exchanged fiat currency for Bitcoin, Litecoin, and Ethereum. Before we get further into the story, consider my biases: I am a Coinbase/GDAX user. I have converted less than $100 into the three digital currencies they sold before Tuesday: Bitcoin, Litecoin, and Ethereum. I use and have written positively about other exchanges, too, such as Uphold. I am not a Bitcoin “maximalist” — people who invest only in Bitcoin and aspire to use only Bitcoin for all of their financial transactions. I see merit in other digital currencies and decentralized apps for various uses, but I do want Bitcoin to succeed in the long term and tend to agree with Bitcoin maximalists’ criticisms of Bitcoin Cash. Seeing how its big backers react to the nickname “BCash” makes me concede that it appears BCH’s growth depends almost entirely on another coin’s established brand name. Why are people angry with Coinbase? Bitcoin fans perceive Coinbase is stacking the deck against BTC so that it can boost demand for “altcoins,” which it can sell more profitably while Bitcoin’s mining fees are abnormally high. They cite Forbes’ 2017 profile of Coinbase’s CEO Brian Armstrong, which reveals that he owns more Ethereum than Bitcoin. They feel the company is dragging its feet on integrating SegWit, a code upgrade to reduce the cost and speed of BTC transactions which will also enable the use of an upcoming upgrade called Lightning. The general reaction to Coinbase’s BCH launch appears to be a widespread lack of trust and allegations of incompetence — or worse, market manipulation/crimes. Coinbase's main problems are keeping the exchange servers up and dealing with high BTC fees. So instead of integrating Segwit, they add BCash and make both problems worse. Is @coinbase smart enough to have timed this announcement w/ Bitcoin mining difficulty retarget period, peak mempool/tx fees right after @CMEGroup futures/bull run to maximize damage to Bitcoin (slow network+fees) to compound BCash trading gains with news cycle spin control? If this is not inside trading, I don't know what is! Advice to exchanges: when trying to tank #Bitcoin to pump an altcoin (eg #Bcash), at least try to look like you're not colluding or engaging in insider trading WHILE leaving a huge trail of anti-Bitcoin sentiment WHILE promoting every single contentious fork. Yet given the semi-anonymous nature of BTC/BCH, it appears almost impossible for a private company to effectively investigate insider trading or enforce non-disclosure rules. Bitcoin exchanges without fiat support do not require identity verification, so we may never discover who acquired Bitcoin Cash right before the Coinbase launch. Bitcoin maximalists mocked Armstrong rather mercilessly for his statement. Brian, how many companies in the world that have been found guilty of fraud, market manipulation, insider trading, etc have had written policies that allowed them to do so? A self investigation? Where have I heard this before? The responsible thing to do is announce to all in advance when trading will being instead of trying to hide information that can easily be capitalized on. @coinbase is becoming very shady, we will no longer recommend them. Even as most traders were caught off guard by the launch, it seems Coinbase and GDAX were not prepared, either. 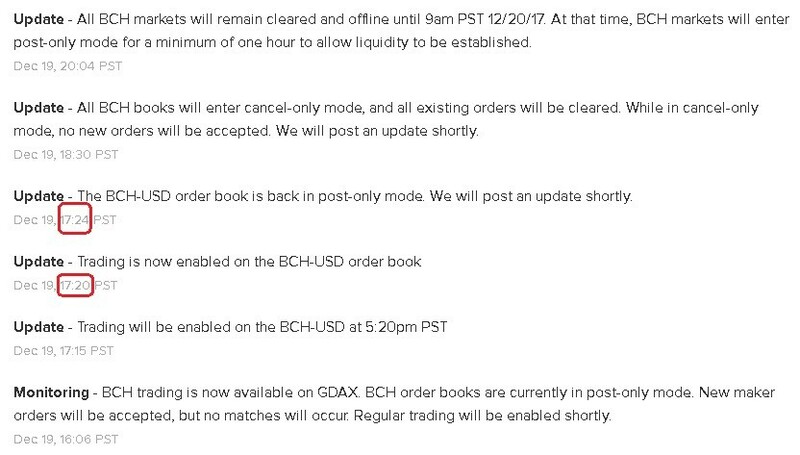 The site quickly halted the ability to buy and sell BCH — after only four minutes of trading, according to GDAX’s status updates. The sudden activation of BCH trades seemed to contradict multiple public statements from the company. Coinbase VP Dan Romero wrote just days before the BCH launch that “We are prioritizing security and performance over new features,” promising customers that the company was more focused on integrating SegWit than adding new products to the service. Four days after publishing this blog, Coinbase launched a new feature that inarguably choked its performance. In addition, most users expected the company to limit Bitcoin Cash functionality to withdrawals for at least a brief time period. Romero published a blog post on August 3, several days after the creation of Bitcoin Cash, promising to give users access to their forked coins by January 1, 2018. He seemed to suggest that trading support would come “at a later date” — after the creation of BCH wallets for all Coinbase users. That expectation was reinforced by a “road map” displayed on Coinbase’s website just days before the launch (as seen in a December 13 archive here). you had this plan a month ago? you launched 12 days early, changed your faq and introduced BCH trading when you specifically listed it would only be withdrawls. you want trust? lol start with doing what you say. Coinbase did not respond to an email from Breitbart News asking why the company launched trading with almost no advance notice — instead of first giving users time to withdraw and manage the BCH they gained during the August fork, then announcing a future date when trading would begin. Coinbase did not answer whether an apparent leak of BCH functionality in their API accelerated the decision to activate Bitcoin Cash trading. At the time of this writing, the Coinbase website is still using placeholder images on the page containing its instructions for BCH purchases. After Coinbase and GDAX disabled Bitcoin Cash trades, users posted several screenshots of the interface showing the coin’s price spiking way above $9,000, while on virtually all other exchanges it hadn’t cracked $4,000. The Twitter account of a CNBC program used one of these screenshots to tease an interview with Roger Ver on Wednesday. BCH critics expressed concern that the appearance of such a dramatic price pump would give unrealistic expectations for investors. Coinbase: "We've added Bitcoin Cash!" Coinbase: "Bitcoin Cash sales are currently disabled." Kinda weird timing man. Now tomorrow Roger Ver showing CNBC a screenshot of BCH at 8500 on CB app so when holiday shoppers with dispensable income and cryptolust see its 3k they’re gonna jump on the “deal”. The morning after, that spike was no longer visible on the site’s price chart for Bitcoin Cash. At the time of this writing, Bitcoin’s price has dipped to around $16,400 per full unit, down from a high earlier this week of about $20,000 but roughly the same as it was one week ago. Bitcoin Cash is currently trading about $4,000 per full unit, according to CoinMarketCap. The Bitcoin community is doing everything it can to make Coinbase feel the heat for the events of the past 24 hours — with many of the company’s critics urging others to boycott or delete the app and promoting a rival exchange called Gemini. Personally, I’m not sure that I will stop using Coinbase’s GDAX platform — which allows me to exchange small amounts of USD for Bitcoin without any fees. And I doubt that a Twitter campaign will make a noticeable dent in the company’s bottom line; it has millions of users and processes billions of dollars in assets. But Coinbase users, like anyone buying from digital currency exchanges, should exercise extreme caution and make sure that you own your Bitcoin. The whole point of the technology is to have trustless exchange — and it’s becoming clearer that any centralized store or exchange of assets should not automatically be trusted. Always remember to store your assets offline if possible, in hardware or paper wallets, or on a device that is only connected to the Internet when you need to use it. This article should not be considered financial advice or a recommendation to buy or sell any assets as investments. The post The Bitcoin Community Is Furious with Coinbase’s Surprise Launch of ‘BCash’ appeared first on News Wire Now.